Fiorenzo Magni riding with his broken collarbone, Giro d’Italia 1956 edition. 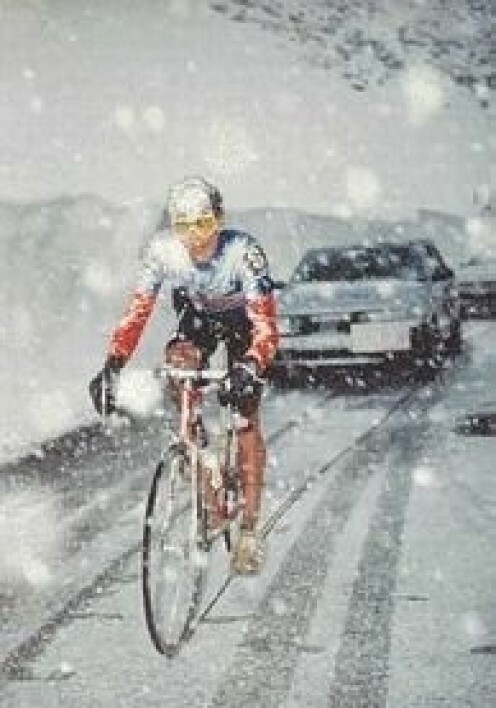 This image has been rated as “the most iconic image of the Giro d’Italia history”. On June 30, 1946, during the 12th stage of the Giro d’Italia, from Rovigo to Trieste, some anti-Italian activists who wanted Trieste to be part of the newly-formed Yugoslavia stopped the Giro 2 km east of the village of Pieris. On June 30, 1946, less than a year after the end of World War II, during the 12th stage of the Giro from Rovigo to Trieste, some anti-Italian activists who wanted Trieste to be part of the newly-formed Yugoslavia stopped the Giro 2 km east of the village of Pieris, nearly 40 km before the finish line. The activists blocked the road with cement blocks and threw stones and nails at the riders. 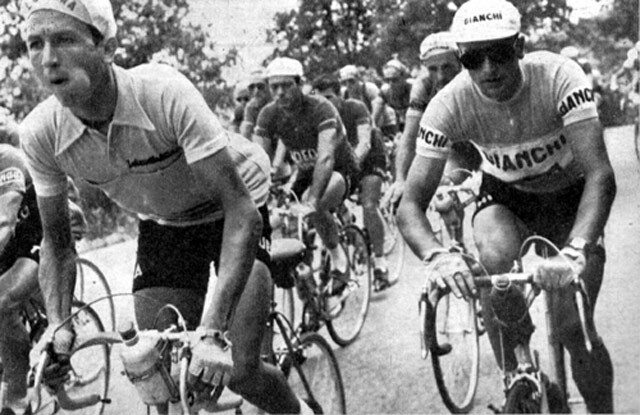 The Giro organization had already decided to declare the stage end in Pieris and neutralized the general classification for the day, but some of the riders, led by the Trieste-born Giordano Cottur, insisted on riding to Trieste anyway.This was the first Giro and the first Grand Tour that both Italian legends Fausto Coppi and Gino Bartali were opponents on separate teams. Bartali was the overall victor. 2. Which are the three best Giros of all time? 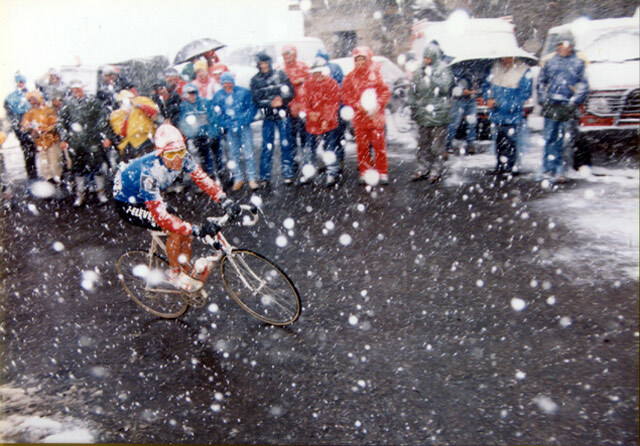 Result: 1949, won by Fausto Coppi, Coppi take an epic stage victory between Cuneo and Pinerolo with a 192km solo attack; 1988, won by Andrew (Andy) Hampsten after the epic stage on the snowy Gavia Pass in the storm; and 1998, won by Marco Pantani, the first part of what was to be a Giro-Tour double that year. In 1949 Giro d’Italia, by the end of stage nine, Fausto Coppi was almost ten minutes behind leader Adolfo Leoni. In stage ten with its three major Dolomite passes, Coppi was able to come within 28 seconds of the lead.Then, in one of the most famous rides in cycling history, Coppi was first over five major Alpine passes in stage 17, between Cuneo and Pinerolo. That ride put him more than 23 minutes ahead of GC second-place Gino Bartali. 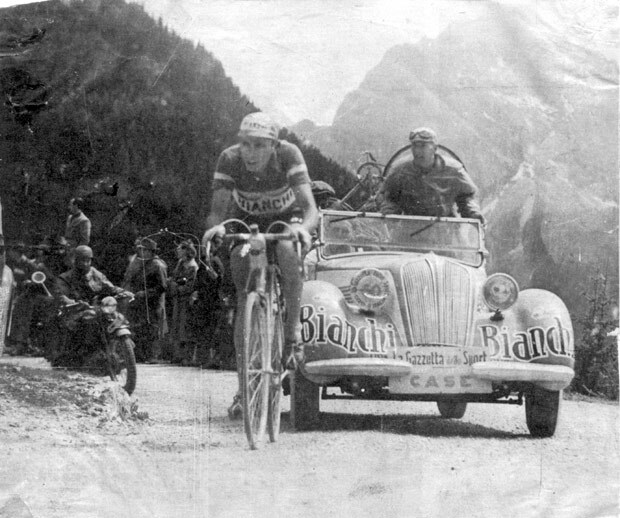 Those two stages gave the 1949 Giro to Fausto Coppi. Coppi went on to win the Tour de France the same year, making him the first-ever Giro/Tour double winner. In the legendary stage fourteen of the 1988 Giro d’Italia with its crossing of the Aprica, a 120-kilometer trip partway up the Tonale and then a left turn up the south face of the Gavia pass with a final steep, technical descent into Bormio. The day was wet and cold. Until the start Torriani had been considering an alternate route because of the possibility of bad weather. 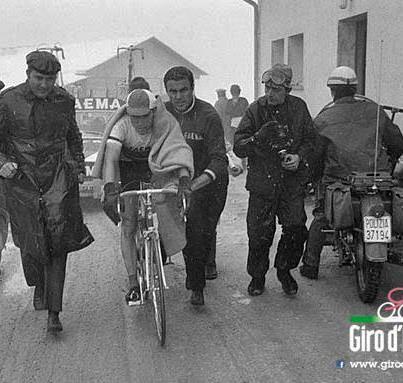 It would end up being, in the words of La Gazzetta, “the day the big men cried.”Over the first two climbs, the cold, wet riders stayed together. When they began ascending the Gavia with its patches of fifteen percent gradient (back then, only the Gavia’s switchback turns were paved), it began to snow and as the riders continued up the pass, it got ever colder. Johan Van der Velde, in just shorts and short sleeves, was first over the top. He was followed a few seconds later by Breukink, Hampsten and then by Chioccioli and Marco Giovannetti.Breukink and Hampsten had dropped the Italians well before the summit and crested together. The conditions were appalling; the road was frozen and when the riders began the descent, their brakes wouldn’t work on the frozen rims. Some had their gears jammed up with ice. Van der Velde gave up, dismounted his bike, waited for warmer clothes to be brought from the team car and descended the steepest part of the pass on foot. He lost 47 minutes that day. Andrew Hampsten became the first American, and non-European, to win the Giro d’Italia. In 1988 Giro, Pantani’s lead is cut to 27 seconds by Pavel Tonkov, before the final mountain stage. Pantani needs a bigger cushion, so he attacks Tonkov repeatedly on the final climb. Tonkov sticks to him like glue, but he falters at three kilometers to go. 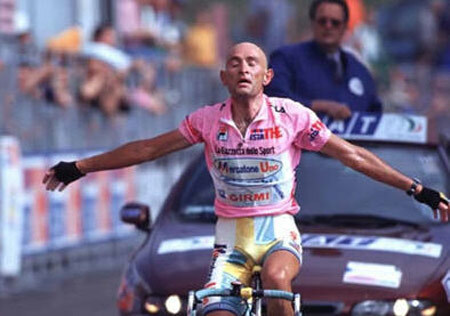 Pantani sees, and attacks hard, a final time. 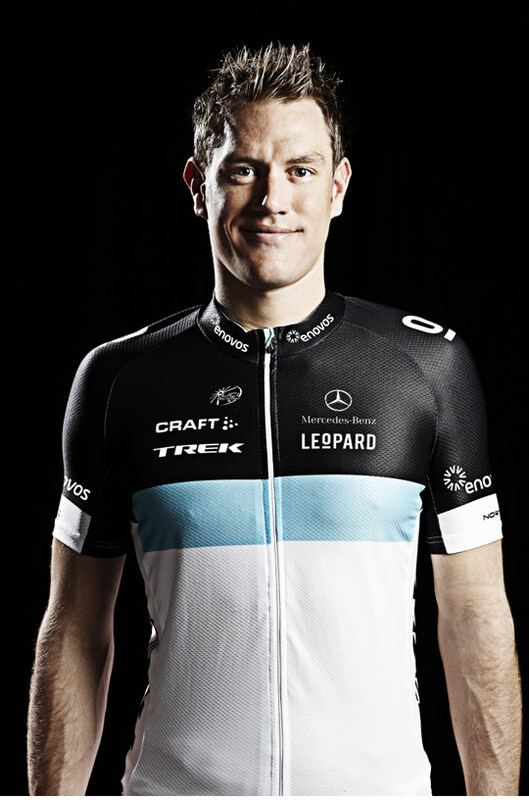 By the finish he is a further minute ahead of his rival, enough time to win the Giro. 3. Which was the best stage victory of all time? Result: The 17th stage of the 1949 Giro d’Italia, won by Fausto Coppi, also voted as the best stage victory of all time. Result: Gino Bartali, Fausto Coppi and Felice Gimondi are voted as the three champions that have truly represented the values of the Corsa Rosa. 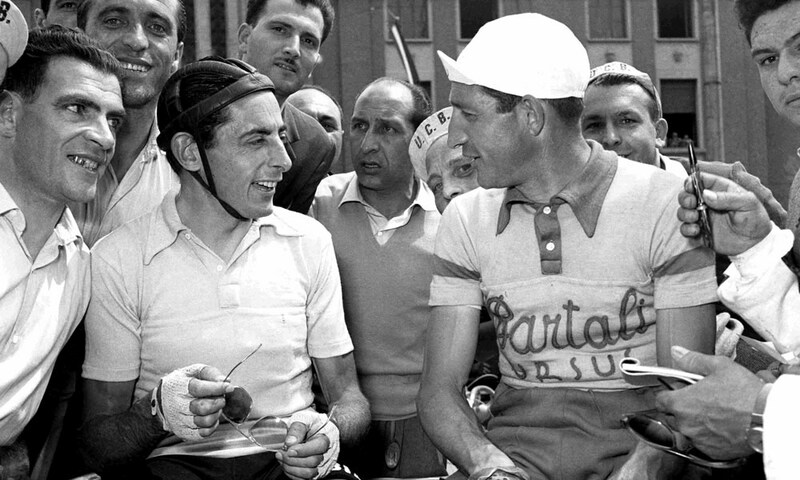 Result: The rivalry between Fausto Coppi and Gino Bartali. Result: The most iconic image from the Giro d’Italia history was voted as that of the recently departed Fiorenzo Magni, riding the Mountain Time Trial of Bologna-San Luca, in the 1956 race. Fiorenzo Magni riding with his broken collarbone, Giro d’Italia 1956 edition. In the 1956 Giro d’Italia, Fiorenzo Magni crashed during stage 12 and broke his left clavicle. The Giro was only at the half-way point with a total of 23 stages. 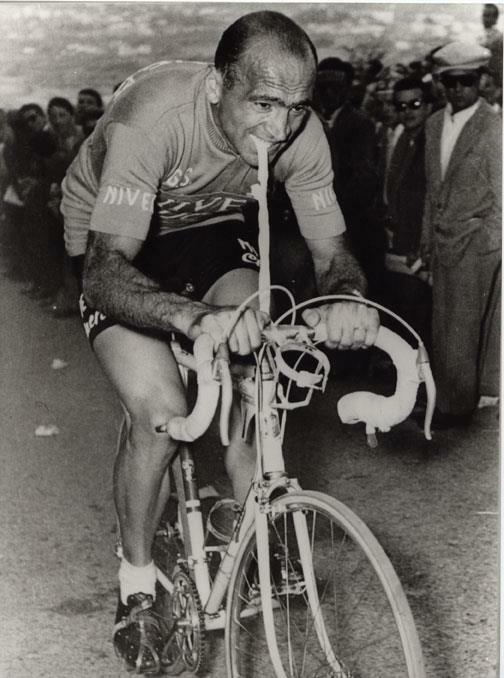 Magni refused hospital treatment and continued the race with his shoulder bound with an elastic bandage.The picture shows the Italian rider during stage 13 holding a piece of rubber inner tube (attached to his handlebar stem) between his teeth for extra leverage. Due to problems with handling the bike while injured, on stage 16, Magni fell again on a descent . He was unable to use his left arm, and he could only effectively brake and steer with his right hand. The unbelievable fact is: Magni finished the 1956 Giro in 2nd place only 3 minutes and 27 seconds behind Luxembourg’s Charly Gaul. Result: On May 10th 2011, during the 4th stage of the Giro, the peloton, along with hundreds of thousands of fans lining the route of the 216km stage to Livorno, paid homage to Belgian rider Wouter Weylandt, who died the day before after a fatal crash. Leopard Trek general manager Brian Nygaard said the team would ride the stage in accordance with the wishes of Weylandt’s girlfriend An-Sophie De Graeve, who is expecting their first child in September, but that he would allow individual riders to make their own decisions about whether ot not to continue after that. In a subdued atmosphere before the start the riders, each wearing a black armband, observed a minute’s silence and a military band played a bugle tribute. To share the workload, each team pulled at the front of the peloton for 10km in reverse order of the team classification, with the Garmin-Cervélo team of maglia rosa Millar taking the final turn. Leopard Trek rode the final kilometres to the finish together at the head of the peloton, just as the Motorola team of Fabio Casartelli did at the Tour de France in 1995. They were joined at the front by Garmin’s Tyler Farrar, a close friend of Weylandt. 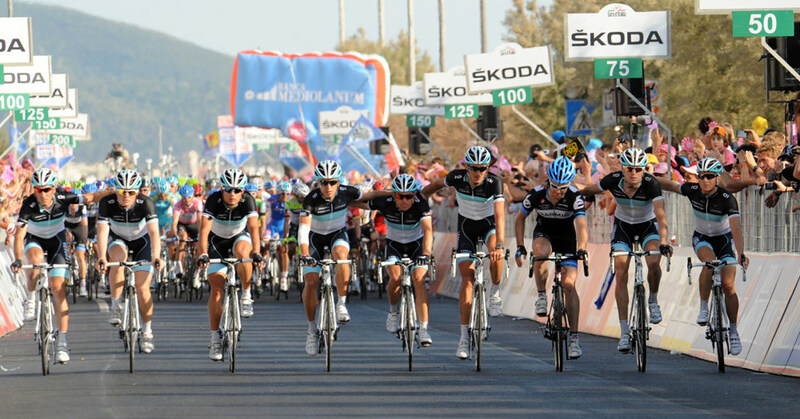 The line of nine riders crossed the finish with their arms around each other to the applause of a substantial crowd. 8. What is the statement or quotation that best represents the spirit of the Giro? There’s only one man in the lead: his jersey is celeste and white; his name is “Fausto Coppi”. Result: The Swiss rider Carlo Clerici, racing the Giro in 1954 as a domestique for Hugo Koblet, won the overall race after one of the most famous fughe bidone (Italian term meaning a fluke attack, invented by the Italian press after that specific occasion) in cycling history. Carlo Clerici, in pink jersey, Giro 1954. The winning move was made on the stage from Naples to L’Aquila, 252 kilometers, where Clerici gained an insurmountable time advantage, more than half an hour on the peloton. No one was able to recover this entire margin over the remaining stages, despite the fact Clerici was not a great climber.“We had underestimated him,” recalled Fiorenzo Magni, three-time winner of the Giro, to La Gazzetta dello Sport. “We were certain that we could drop him in the Alps, on the other hand, Clerici, who up to that point had won nothing, proved to be a good rider.” He closed the 1954 Giro with 24’16” on compatriot Koblet, 26’28” on Assirelli and 31’17” on Coppi. 10. Which are the most impressive sporting feats in more than 100 years of battles on the roads of the Giro? Result: Third: Fausto Coppi dominating Cuneo to Pinerolo in the 1949 Giro; second is Marco Pantani winning in Oropa on the 15th stage of the 1999 Giro after a glorious comeback from a mechanical problem at the base of the final climb; and in first place, the most impressive sporting feat in over 100 years, is Eddy Merckx winning the 12th stage of the Giro in 1968, from Gorizia to Tre Cime di Lavaredo. At that day, under a snowstorm, Merckx closed a ten-minute gap on a breakaway group to win the stage and seal the first Belgian victory in Giro d’Italia.